Have you ever wondered how I make one of these paper sculptures? I start by sketching my idea on paper and then illustrating it in Adobe Illustrator. Once I am happy with the overall flat art, I break the illustration down and create the cut files for either my Silhouette Cameo or Cricut Maker. For a project like this, I love using the Cricut’s new Scoring Wheel. It creates precise score lines and makes folding the die cut paper so easy! To display my paper art, I love the Ribba shadow box frames from Ikea. They are 10″ x 10″ and are 1.75″ deep. I thought it was appropriate to showcase Barbie in her original 1959 black & white swimsuit. My daughters love that I placed her white sunglasses in her hand and gave her dangling gold hoop ear rings. The only thing missing from this shadow box is a slice of birthday cake!!! Happy Birthday, Barbie! Join me every Saturday as I will be posting a new step-by-step craft tutorial, original printable project, link to a favorite cut file, or an activity for you to make with your kids. 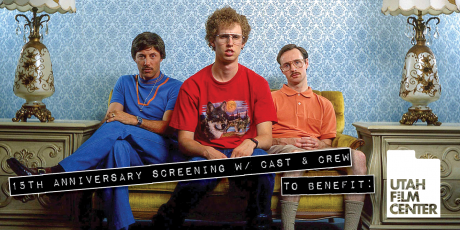 To celebrate Napoleon Dynamite’s 15th Anniversary, Utah Film Center is hosting an anniversary screening with members of the cast & crew . . . INCLUDING yours truly!!! I will be selling my homewoven handicrafts alongside Deb’s famous Caboodles case! Proceeds from this event and 25% of my boondoggle sales will go to the Utah Film Center. Click here to purchase tickets! *Guests are subject to change.